SAC Answer Key 2018: Technician B Answer Key 2018 is available now for Technician B Exam 2018. The exam was organized by Space Applications Centre on 18 Nov 2018. SAC Technician B Answer Key 2018: Space Applications Centre has issued the Answer Key on 29 Nov 2018 for Technician B Exam 2018 which was conducted on 18 Nov 2018. Answer Key can be accessed from the link given below. SAC Catering Attendant A Answer Key 2019: Space Applications Centre has issued the Answer Key on 06 Mar 2019 for SAC Catering Attendant A Exam 2019 which was conducted on 20 Jan 2019. Answer Key can be accessed from the link given below. 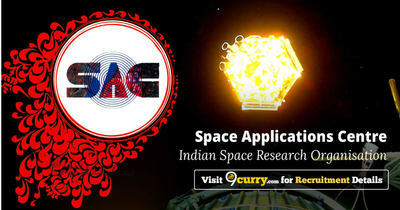 SAC Cook Final Answer Key 2019: Space Applications Centre has issued the Answer Key on 01 Mar 2019 for SAC Cook Exam 2019. Answer Key can be accessed from the link given below. SAC Technician-B Answer Key 2018: Space Applications Centre has issued the Answer Key on 18 Dec 2018 for Technician-B Exam 2018. Answer Key can be accessed from the link given below. SAC Technician B Final Answer Key 2018: Space Applications Centre has issued the Answer Key on 19 Nov 2018 for SAC Technician B Exam- 2018. Answer Key can be accessed from the link given below. SAC Technician-B (Turner) Answer Key 2018: Space Applications Centre has issued the Answer Key on 23 Oct 2018 for the exam which was conducted on 21 Oct 2018. Answer Key can be accessed from the link given below. SAC Technician B Machinist Answer Key 2018: Space Applications Centre has issued the Answer Key on 23 Oct 2018 for the exam which was conducted on 21 Oct 2018. Answer Key can be accessed from the link given below. SAC Technical Assistant Final Answer Key 2018: Space Applications Centre has issued the Answer Key on 10 Jul 2018 for Technical Assistant Exam 2018 which was conducted on 01 Jul 2018. Answer Key can be accessed from the link given below. SAC Scientific Assistant Final Answer Key 2018: Space Applications Centre has issued the Answer Key on 10 Jul 2018 for Scientific Assistant Exam 2018 which was conducted on 01 Jul 2018. Answer Key can be accessed from the link given below. SAC Technician-B Final Answer Key 2018: Space Applications Centre has issued the Answer Key on 10 Jul 2018 for Technician-B Exam 2018 which was conducted on 01 Jul 2018. Answer Key can be accessed from the link given below. SAC Pharmacist A Final Answer Key 2018: Space Applications Centre has issued the Answer Key on 10 Jul 2018 for Pharmacist A Exam 2018 which was conducted on 01 Jul 2018. Answer Key can be accessed from the link given below. SAC Pharmacist A Answer Key 2018: Space Applications Centre has issued the Answer Key on 02 Jul 2018 for Pharmacist A Exam 2018 which was conducted on 01 Jul 2018. Answer Key can be accessed from the link given below. SAC Technician B Answer Key 2018: Space Applications Centre has issued the Answer Key on 02 Jul 2018 for Technician B Exam 2018 which was conducted on 01 Jul 2018. Answer Key can be accessed from the link given below. SAC Technical Assistant Answer Key 2018: Space Applications Centre has issued the Answer Key on 02 Jul 2018 for Technical Assistant Exam 2018 which was conducted on 01 Jul 2018. Answer Key can be accessed from the link given below.